Firing clay is the essential step that transforms dirt to stone. The earth's elements are changed to beautiful glass (glaze) with the application of a lot of heat. We use electric kilns because they are convenient all are computer controlled and very reliable. Gas kilns need to be monitored for the whole firing. And can be used where a lot of electricity is not available. KM means Kiln Master Digital! KMT means Kiln Master Digital Touchscreen! Skutt kilns are are the #1 choice of potters. Great warranty (two years parts an labor) and great customer service. The part numbers tell you what size it is; 1027's are10 bricks around and 27" tall on the inside. Kilns for Silver Clay, PMC, Jewelry. Gas kilns are necessary for cone ten, as they don't wear out. Reduction effect and flashing make cone 10 pottery special. Raku Kilns make the craft of Raku possible. In Raku you glaze a piece of bisque, quickly fire up to cone 06 or until the glaze melts. Open the kiln when it is red hot and put the glowing pot in a trash can of flammable paper or leaves. The resulting combustion reduces the metals copper and iron to the metallic form; creating cool effects. The smoke also colors any bare clay black and accents any cracks in the glaze as black crackle pattern. Parts for general repair, Skutt, Paragon and Duncan kilns. Bricks, mortar, insulation, burners that kind of thing. Build your own raku kiln or fix your gas kiln with new brick, Kaowool, pyrometers, cement and more. Olympic gas kiln burners are factory set for use on either propane or natural gas determined by the customer's order. If propane is used, your tank must have a low-pressure regulator like those on a camper or trailer. If an adjustable regulator is used, approximately ½ pound of pressure is necessary. 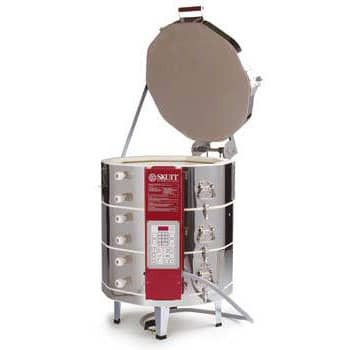 The larger the tank the better; however, a five (5) gallon tank is the minimum size for the 1827G or 18 Raku and a 15 gallon tank is the minimum size for the 2327G/23 Raku and 2827G/28 Raku kilns. Due to gas flow, the propane tank may have a tendency to freeze solid. If ice is observed forming on the outside of the tank, water can be run over it to help keep it melted. The tank can also be lowered into a large bucket of warm water. A larger burner orifice in necessary when used on natural gas pressure, six (6) to eight (8) inches of water column is required. If your kiln was ordered for use on household natural gas, it is equipped this way. Paragon kilns are drop-shipped from Mesquite Texas, they carry so many different models nobody could stock them all! The Skutt Envirovent is great at removing odors from the kiln room. Posts, shelves, cones, stilts, kiln wash and more!